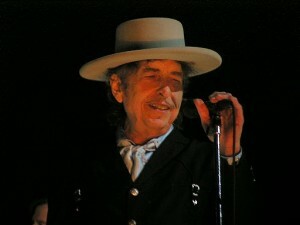 At this point in his storied career, Bob Dylan’s performance art has culminated into a vast and explosive exposition in the form of theater of the absurd.To approach a description of his live performances in terms of set lists and band personnel is to minimize the powerful effect that Dylan’s performance has on his audiences. The controversial scorn and adoration heaped on Dylan is not an incidental by-product of his art; it is a reflexive and organic component of what he does and what he represents. Bob Dylan’s on stage persona at once embodies and fulfills the disparate multidimensionality of a post-modern culture tripping head long through its self- created House of Mirrors. Concert reviewers seek to report and interpret each Dylan grimace, grin or vocalization as if to unlock some essential element of his relationship to his work and his audience. The resultant response being similar to that of witnessing a sleight of hand impresario, as in; “How in the hell did he do that?” You know that you feel a certain way; that you are having a strong emotional response to the songs and yet this is definitely not the love song (Lay Lady Lay?) or emblematic anthem (Blowin’ in the Wind?) that you came to hear. If a valid definition of genius is to be aware of a vast amount of data to the extent that one can assimilate and utilize that data, be it emotional, musical or more; then Dylan is possessed of genius. It is as if the compressed on stage scenarios that punctuate Dylan’s cinematic gestalt, “Masked And Anonymous” are allowed to fully develop in his almost nightly concerts. That same flowering (should I say mushrooming?) of activity redefines the theatricality of rock concerts. No strobe lights or exploding flash pots needed. The singer’s artistic playfulness at once engages his audiences’ preconceptions while he simultaneously lobs a humongous aesthetic custard pie into their faces. And they keep coming back for more; all the time delighting in the bittersweet flings, drips and gobs of irony and contradiction that fulminate from the performance. As the extraordinary renditions of his songs shift from night to night, so must the expectations of Dylan’s audiences. To hear the snarl of Positively Fourth Street alchemized into the plaintive longing of a dispossessed lover is to experience the same emotional impact of the most powerful dialogue spoken in the theater of the absurd. The inherent contradictions displayed in Dylan’s gestures and song stylings challenge logical traditional theatrical and aesthetic interpretation. Bob Dylan’s songs are valued for the power and expression of their lyrics. Listeners don’t find themselves later humming or whistling to the tune of “Highway 61” as they go about their daily tasks. We’re not talking about “Fifty Ways To Leave Your Lover” here. Yet as Dylan now presents these lyrics live in concert they are so obfuscated by vocal slur, change in inflection and inapplicable musical disarrangement that they are rendered nearly unrecognizable within the context of the originals. This kind of delivery challenges the audience’s sensibilities in the same way as the most disjointed, repetitious seemingly meaningless dialogue of Beckett or Genet. That Dylan at this stage in his career would undertake to approach his material this way is not surprising. It is keeping with his self- professed role as “musical expeditionary” as well as his smirking depiction of himself as a “song and dance man”. This is the eclectic and innovative artist that early in his career embraced the work of Bertolt Brecht and later collaborated with playwright Sam Shepherd. Through the varied, transformative presentations of Dylan’s diverse songs in concert, the tuned-in audience participant is treated to a dynamic, constantly spinning pinwheel phantasm containing the full spectrum of identities, personalities and personae that have been projected upon the cultural icon, “Bob Dylan.” The Mariachi troubadour entreating for one more cup of coffee morphs into the Dadaist rock ‘n roll rogue who invites you to join him as he romps Highway 61,but then through the gift of legacy and transcendence becomes the ‘60’s folkie that warns of the desolation that the hard rain can bring. The off-to-the-side Oscar statuette that has been a part the artist’s stage set for the last decade is a brilliant exclamation point to his forty plus years of performance. He was awarded it for his song “Things Have Changed” which appeared in the film Wonder Boys; not for any acting role that he’s done. And yet what other entertainer has presented his audience with such a vast variety of characters and proclamations and enunciations, both abstruse and heartfelt, than Dylan has? Maybe the folks at the Academy got it wrong.